Between 18:30 and 08:30 during the week and Saturday and Sunday, emergency calls are dealt with by the 111 service. 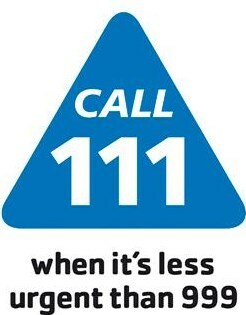 If you require medical treatment that is not life threatening call 111(freephone). Your call will be triaged and passed to the most appropriate person to deal with your problem. If you are offered a home visit at night please ensure the doctor can find you. This is available at One Medicare at Rockingham House, Broad Lane. It is presently open from 08:00 to 22:00 7 days a week and you don’t need an appointment – just call in at a time convenient to you and you will be treated. Please call the above number to check exact opening times before you attend. They deal with healthcare advice and minor illnesses, as well as suture removal and routine post-operative dressings.